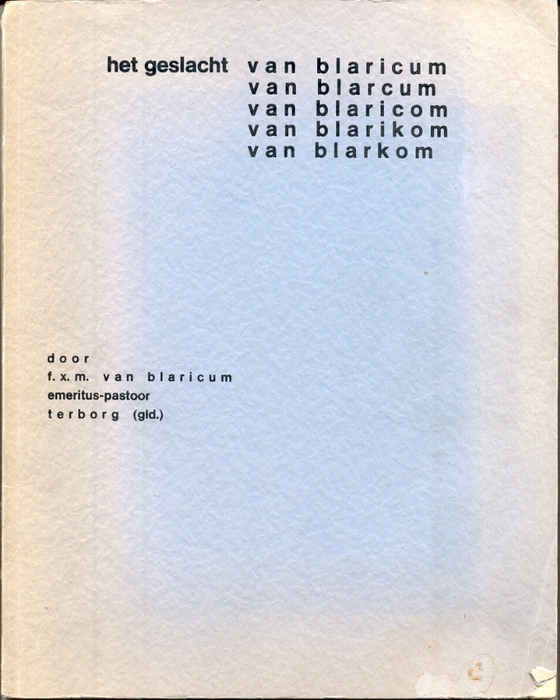 My father gave me in 2002 3 books about the family van Blaricum, etc. I liked them very much but found it difficult to follow my own line, especially when you have also separate additions and corrections. In that time I wanted to make a website but didn't have a theme. I decided to make a site with my family tree, because navigating through a digital tree is much easier by the links you can add. The basis is formed by the book of mr. F.X.M. van Blaricum and his two additions. Since then a lot is corrected and added, also thanks to reactions on the website. The data is stored in a database with the program Aldfaer. From this program the webpages with the family data are generated by use of templates. With each tree is is possible to print a special version. This print version has no colours and navigating is possible by following the index number of a person. I keep on looking for new information and pictures, documents, etc. If you can help me with that, please send me an e-mail. Living people are mentioned in the trees. If you don't want your data on the Internet, send me an e-mail. In that case I will show only the surname (completely) and the first names (initials).